I’ve seen many luxury tile showers built with the best intentions to provide a long lasting system with plenty of storage for soap, shampoo and other bathroom products. Unfortunately years of continuous service are often not kind to tile showers. Grout joints become moldy or discolored. Recessed soap and shampoo niches are often scummy and nearly impossible to clean in the corners. 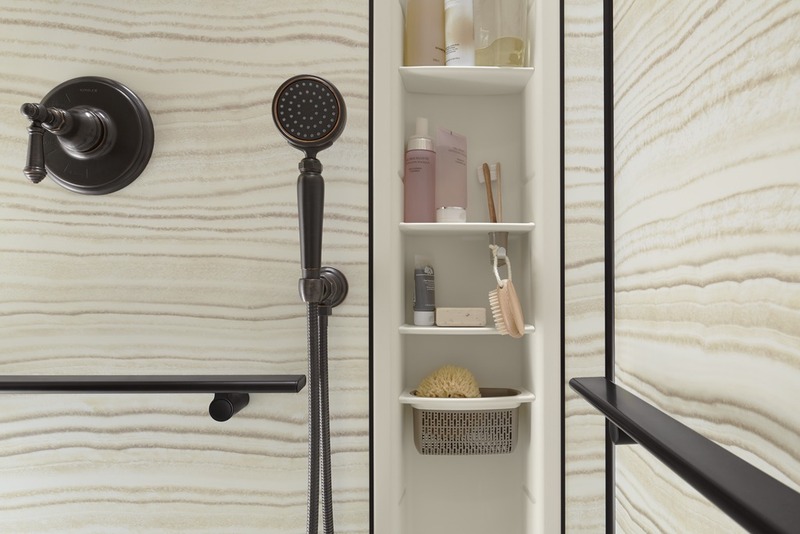 What’s exciting now is it is possible to liberate yourself from the hassle of cleaning a tile shower and the frustration of inflexible storage options. A new ergonomically designed shower storage system is available which is grout free, easy to clean and even offers adjustable shelving when your needs or people using the shower changes. In the article below learn 3 ½ new shower storage options which are revolutionary in their design for the luxury shower market. This product is not the sweaty gray lockers you might remember from 7th grade gym class. This shower locker is completely adjustable system allowing the shelves to be moved from one slot to another for different sized showering products. One shelf has a built in space for a tooth brush or shaver. There is also a standard basket which is excellent for small items like loofas. 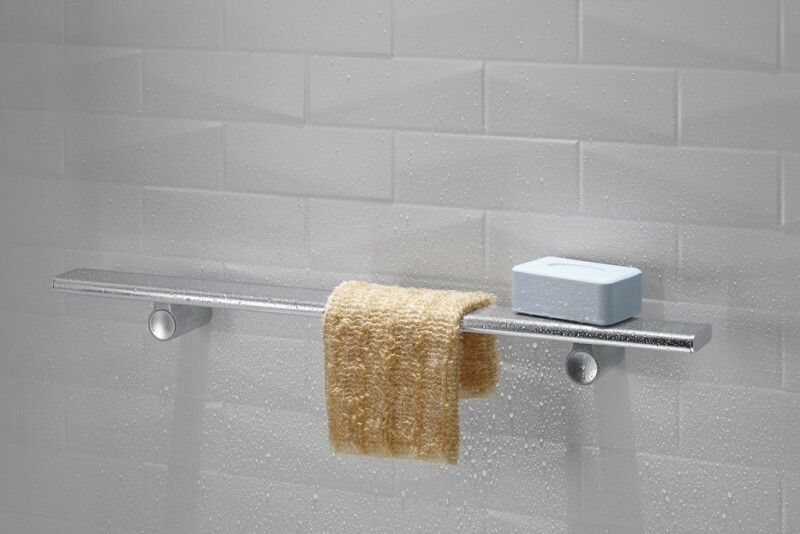 The shower locker comes in white, dune, biscuit, almond, grey and sandbar colors. The shelves can be removed to make cleaning a snap. The back of the unit is rounded so no water is trapped between the shelves and the locker itself. A tile shower simply does not have this type of flexibility or ease of cleaning features. 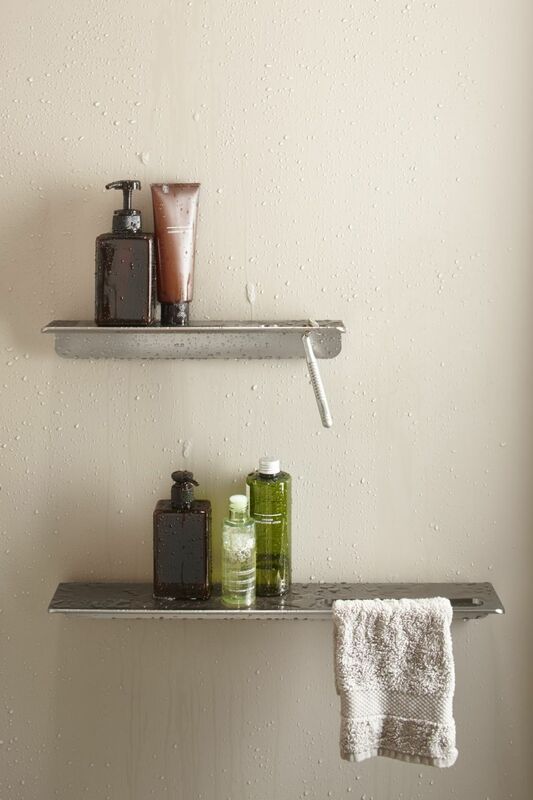 Place these shelves anywhere you like in the shower. Since they are positioned a small distance off the wall surround panels dirt and soap scum won’t get trapped between the shelf and the wall (it uses the same design principles as the shower locker discussed above). Ergonomically you can place them in the best location for those using the shower (whether your family members are short or tall or even if they shower from a seated (wheelchair) position). These shelves (which come in 7”, 14” and 21” sizes) can be removed for easy cleaning, have a curved edge to keep products from falling into the wet space, and have a handy slot for a hand towel. Just like a ballet dancer will use a bar for stability this multi-purpose shower bar provides a safe way for someone to stabilize themselves while scrubbing their feet or shaving their legs. The slim, flat profile (available in anodized aluminum with a teak add on tray) also doubles as a place for towel and product storage. Sizes include 24”, 36” 40” and 54”. OK – this isn’t a large of revolutionary product but it comes in handy. 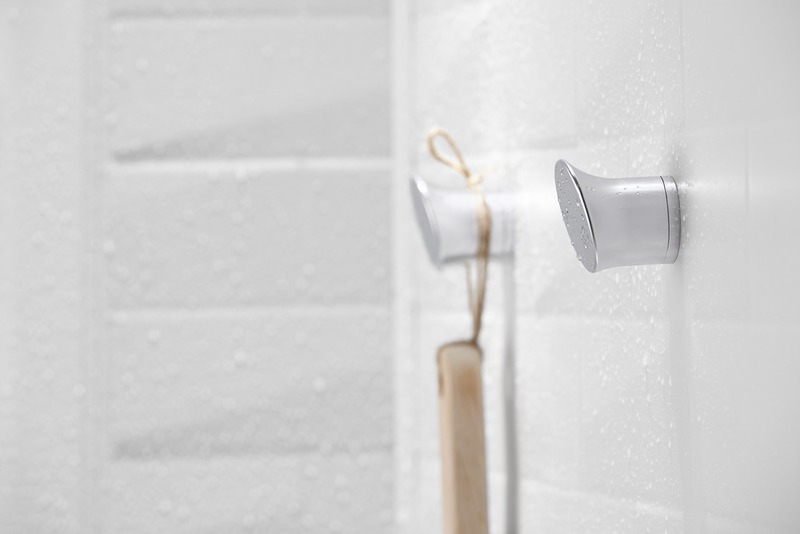 The shower hook (which is made of anodized aluminum) provides a convenient way to dry towels, robes or loofas inside or outside the shower or tub area. Would your luxury shower or bathtub benefit from improved storage (or is screaming out we need better storage NOW!). Comment or call us at the numbers below to learn more about luxury shower wall panels and these innovative storage solutions. If you’re looking for more information or an estimate on remodeling a shower or nationwide material supply for the various wall panels and storage solutions mentioned above call The Bath Doctor in Cleveland (216-531-6085), Columbus (614-252-7294) or for nationwide supply Innovate Building Solutions (877-668-5888).